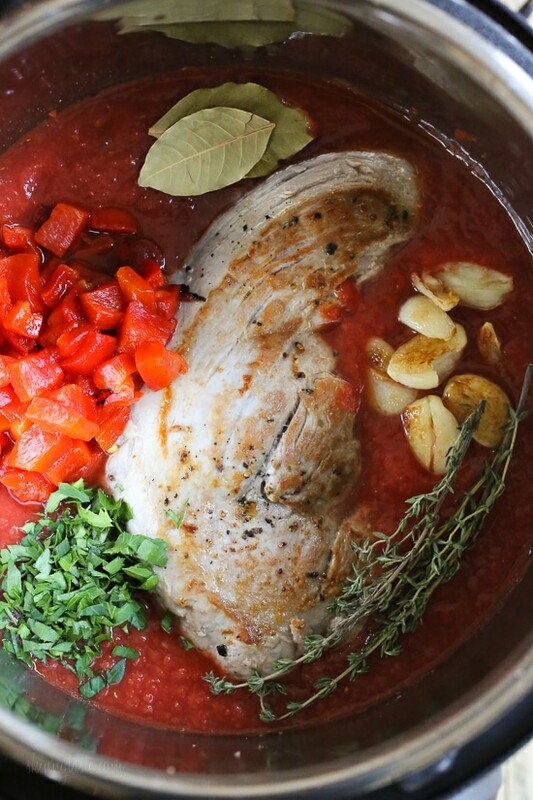 A hearty sauce made with Pulled pork, tomatoes, roasted peppers and fresh herbs. Wonderful served over pasta, spaghetti squash or spiralized noodles. I’ve tested this several ways, in the slow cooker, pressure cooker and stove and it comes out great any way you wish to make it! Pork tenderloins are a great lean option and come out very tender. Browning them first really adds depth of flavor to the sauce. This sauce is incredibly light, so even if you want this over pasta which is how my husband ate it, it’s still a low calorie dish. If you want this over spiralized zucchini, the question I get asked often is how I cook them. I like to heat a large skillet on very high heat, add a little oil and cook them really quick, about 1 1/2 to 2 minutes tops then quickly remove from the skillet so they don’t continue cooking. This way they still have a little bite to them and don’t get watery and mushy. Pulled pork is not just for sandwiches, it’s wonderful in this hearty sauce which is perfect over pasta, spaghetti squash or spiralized noodles. Instant Pot: Season pork with salt and pepper. Press saute button to warm, add oil and garlic and saute until golden brown, 1 to 1 1/2 minutes; remove with a slotted spoon. Add pork and brown about 2 minutes on each side. Add the remaining ingredients and garlic, reserving half of the parsley. Cook high pressure 45 minutes. Natural release, remove bay leaves, shred the pork with 2 forks and top with remaining parsley. Serve over your favorite pasta. Slow Cooker: Season pork with salt and pepper. Heat a medium skillet over medium-high heat, add oil and garlic and saute until golden brown, 1 to 1 1/2 minutes; remove with a slotted spoon. Add pork and brown about 2 minutes on each side then transfer to the slow cooker with the garlic and the remaining ingredients, reserving half of the parsley. Cook 8 hours low. Remove bay leaves, shred the pork with 2 forks and top with remaining parsley. Serve over your favorite pasta. Stove Top: Season pork with salt and pepper. Heat a large pot or Dutch oven over medium-high heat, add oil and garlic and saute until golden brown, 1 to 1 1/2 minutes; remove with a slotted spoon. Add pork and brown about 2 minutes on each side. Add the remaining ingredients to the pot including the garlic, reserving half of the parsley. Bring to a boil, cook covered on low until the pork is tender, and shreds easily, about 2 hours. Remove bay leaves, shred the pork with 2 forks and top with remaining parsley. Serve over your favorite pasta. I didn’t like this a all. Feel bad about saying it. I test a lot of recipes and I was embarrassed to serve this to my family. It tasted like pork cooked in a tin of tomatoes. I followed the recipe exactly, and the pork shredded perfectly. The sauce had no depth…. and I used expensive tomatoes and the tenderloin was expensive. Boo. Now I have to figure out how to perk up the leftovers. I enjoyed this recipe very much, although I was concerned about the sauce depth initially after reading your comment. If needed, I add my personal touch to sauces to tailor it more to my tastebuds, such as adding red wine, balsamic vinegar, ground chipotle or red pepper, garlic salt, etc. If you like more spices, jazz it up. 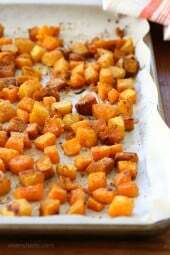 Hi there, I will be making this recipe fairly soon and wondered if I can follow the recipe as it stands for the stove top and finish off the cooking process in the oven. If this works, what temperature should I have the oven and for how long? Not sure, I haven’t tried it that way. I have an 8qt instant pot. Should I change any of the ingredient amounts, like the amount of liquid? Would this be an okay recipe to freeze afterwards? Can this be augmented to be made with Jackfruit instead of pulled pork? If so, how much jackfruit, and can I put it in the slow cooker? THANKS! Hm I haven’t tried with jackfruit. This looks really good, but 10 servings is a lot for us. If I half the recipe – would the cook time be effected in the crock pot or the stove? Made the InstaPot version. So easy. I roasted a red pepper under the broiler and used that in place of the jarred peppers. Served it as suggested with Zoodles. The remainder was divided into 2 portion servings and frozen to enjoy later. I have about 2.5 pounds of pork tenderloin in one package from Costco. Can I just double tomatoes and red pepper, and spices? And what about cooking time in Instapot? Will the higher quantity change the time by much? I have the same question about doubling meat…does cooking time change? My family loves this recipe and it is so simple and delicious. I’ve made it several times and serve it over zucchini. I love so many of the skinny taste recipes! ahhmazing and the whole family loved it!! 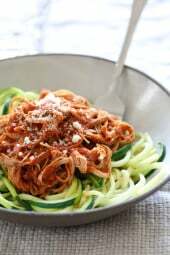 I’m officially obsessed with zoodles now as well! I made this tonight and LOVED it. So did my husband. We called it 5 servings – 1 cup each. 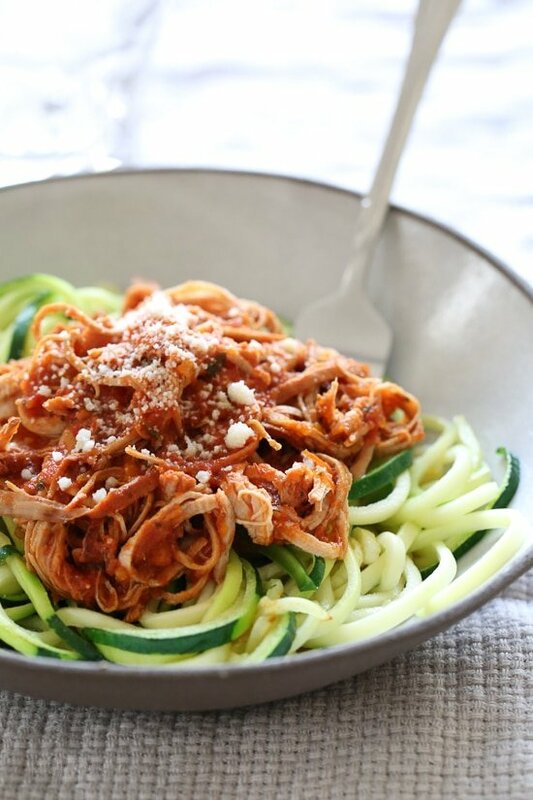 With zucchini noodles, we needed more calories than just 1/2 cup. Still only 2 WW points and totally worth it! Thank you!! This was so delicious!! My family except my husband love zoodles. I have enjoyed all the recipes I tried from you!!! Thanks again!!! Made this today in my instant pot. Really delicious flavor! I used dried thyme and puréed the sauce before serving it over wide egg noodles for my husband. I’m going to try it with zoodles next time. Hi, new to your site and it looks terrific! Thank you for all the obvious time and effort you put in to it! Forgive the perhaps dumb question, but the points values you assign do not include the noodles, correct? I made this in my IP and it tasted great. The only thing is that it came out a little watery. I followed directions exactly. What could have gone wrong?? It could have been the brand of tomatoes? In that case, you can press saute after it’s cooked and let it simmer uncovered until thickened, maybe 15 min? This was delicious! Have lots leftover so perfect for lunches for the week! Any idea what the new Freestyle points are? Made it for dinner tonight and it turned out great! My hubby kept asking if there was more meat? Can’t wait to have lunch tomorrow with the leftovers. Thanks for the wonderful recipe. It’s going in my IP recipe Book. Love this recipe! It’s now a regular family rotatation. Freezes well. I bought my Instant Pot solely to make this recipe. Then after some research I learned there has to be one cup of water in the Instant Pot. This recipe does not have one cup of water. And the Instant Pot groups on Facebook say never cook a pork tenderloin in the Instant Pot because it’s too lean. Yikes. Well I had the Instant Pot and I had bought all the ingredients and I needed to get dinner on the table. Skinnytaste has never let me down before, I reasoned. I followed the recipe exactly. The pork tenderloin ragu was amazing. It’s in the rotation. As usual Gina did not let me down. Thanks for the recipe. I don’t have fresh thyme and am not a big fan of it. Any suggestions? I have dried thyme. How much would I sub for it? Hello, Could you add small potatoes and carrots? If so, When should they be put in? Thanks. What is your favorite brand from the jarred roasted peppers? You can freeze the rest for a second meal. I’m sure the sauce has everything to do with the brand of tomatoes you used. What brand was it? 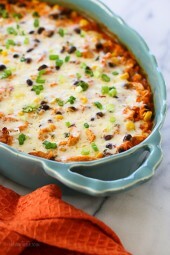 I’m going to get the ingredients and try it this week! Could this be done with frozen pork in the instant pot? If so how would you adjust cooktime? The aroma in the house was fantastic. My husband – who does care much for pork – even loved it! What would the cooking time be in the instant pot if I used a smaller piece of pork like 8oz? Trying to make this for two people and we don’t need all those leftovers. Thank you, thank you, thank you!!! This was amazing! Would these instant pot directions for this work the same with the beef ragu recipe in your cookbook? I wasn’t sure if I would need to decrease liquid. This was really easy to make and so delicious. I used it over zucchini noodles the first day and put it into hoagie buns with provalone and fresh veggies under the broiler for sandwiches the next day. Highly recommend. This was great! Used basil instead of parsley because I prefer it. My boyfriend said multiple times how good this was. Made this tonight – delish!!! Thank you for bringing these fabulous recipes to us. 1 SP for 1/2 cup? Yes please! Hi Gina! I wanted to share that I substituted 18 oz. of pork sirloin steaks (very lean from Whole Foods and only $4.99/lb) and made this in my pressure cooker. It turned out great! The tenderloin’s were quite pricey, so I elected to use the pork SIRLOIN steaks instead – these are NOT the same as a “pork steak”, which has a lot of fat, so the nutritional values were similar after I entered it in MyFitnessPal: fat 3.9g, carbs 7.5g, protein 12g. Loved the flavors of this dish! 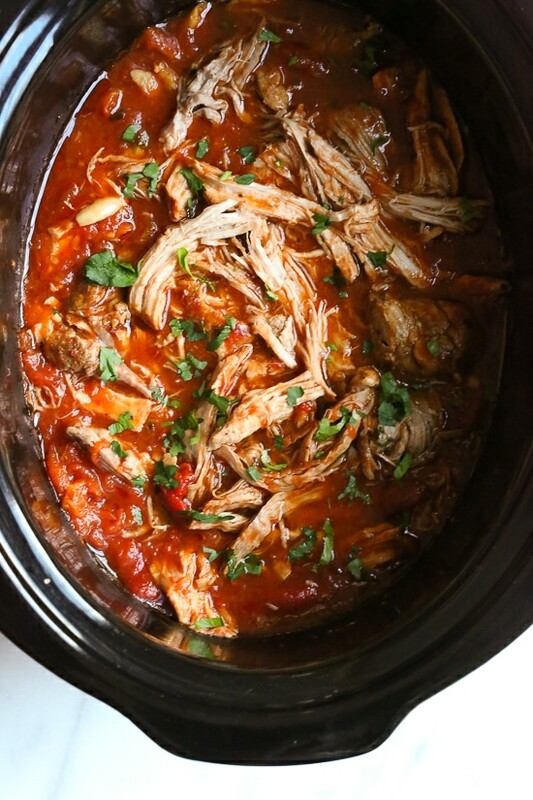 I cooked this in my slow-cooker on low for 10 hours and the pork was so tender! I added a 12oz jar of roasted red peppers as a 7oz jar was not available in the store and I did not brown the meat before putting in the crock-pot. My only suggestion, add more crushed tomatoes. My family found this a little meat heavy for a “sauce” over zoodles. Great recipe! It took a small amount of ingredients, required minimal effort, and gave amazing results. Thanks, Gina! So the serving size ThT includes jicell and meat combinesdo correct ? Sorry the serving size that is for meat and sauce combined correct ? I love the sound of this recipe but there are only 2 of us and this serves 10! I am happy to make enough for 4 if I can freeze it, I just need some help adjusting the ingredients and the cooking time. I will be making it in my slow cooker. Are the points value including the pork? So 1/2cup sauce for 1 SP includes the shredded pork? Seems low. Thanks!! Gina this one was off the chart! Everybody (including the tweener who is only eating blue things from Peru this week) devoured this in one setting and asked for more. I did add some fresh basil and roasted the peppers instead of using jarred to drop the sodium. Keep ’em coming, you’re batting 1000. Great! Glad you enjoyed it Steph! Tried this last night in the crockpot. It was great! Served it over zucchini noodles. The only changes I made was adding a chopped onion and green bellpepper just to give it a few more veggies. Will definitely make again! Is there an Instant pot that you can recommend? I’m not familiar with its use but sounds like a pressure cooker./ slow cooker combination. I remember my mom using one and thought they were pretty dangerous in the day. So delicious! So easy -made it in an instant pot. Used spiralized zucchini – very filling. 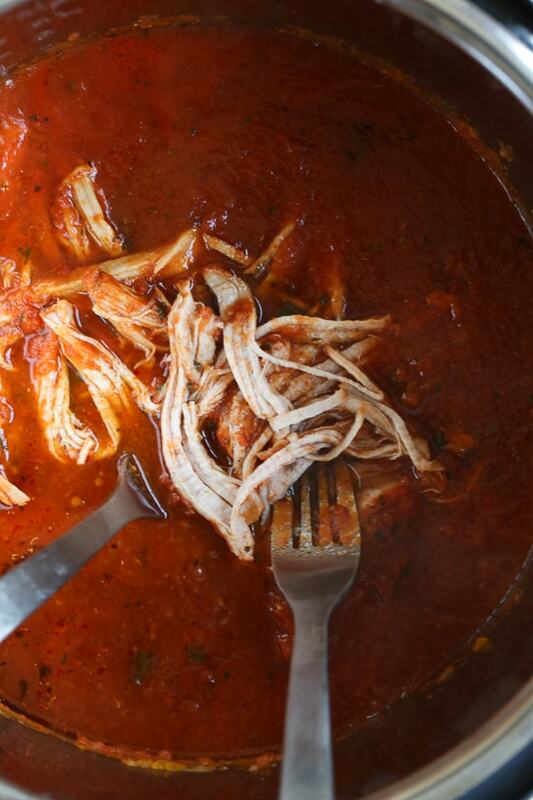 I just made the Italian pulled pork ragu in my slow cooker. This is a keeper for sure. I had to use dried thyme instead of fresh but did everything else the same as the recipe. Using a 18-20 oz Hormel fresh plain tenderloin it was cooked and shreddable in just under 5 hrs on low. The flavor and consistency is just perfect. It will be served over pasta. Really good and easy lowfat recipe. Thank you. Made this last night!! Big hit!! Even my twin four year olds loved it!!! So excited to try this! Would this freeze okay? I cook for just myself so would love to be able to freeze and grab and go as needed. Thanks! I’m new to the instant pot and want to try this recipe. My manual says I need water but it’s not in the recipe. Do I not need it with the crushed tomatoes? I’ve been warned of scorching? Wow! I buy & freeze the 4-pack of “Pork Sirloin Tip Roasts” from Costco. They are round pieces of 98% fat free pork. I used my InstaPot to sautee the olive oil and garlic, then I threw in all the other ingredients, then plopped my FROZEN 2 lb. chunk of pork down in the sauce. I then let it cook at high pressure for 90 minutes, and let it slow release/keep warm for another hour while I was at a movie. This turned out SOOOO good! My picky Italian husband loved it. Thanks for the recipe! Do you drain the peppers or use the water they came in? I have made a lot of your recipes but I have to say this is one of the BEST! I served it over spaghetti squash and it was amazing!! Husband and I just started Whole 30 and this was perfect! Thank you for tagging Whole 30 approved recipes. I love your recipes and got an instant pot and inspiralizer for Christmas! Could I cook a pork shoulder instead? And would I then have to double all the other ingredients as you suggested for the tenderloin? 28*2 oz of tomatoes seems like a lot? Yes, although I found it a bit dry. The tenderloin was tastier. Where do y’all find tenderloins that small. So far The smallest I can find is 5lb. Do you just buy a big one, cut it up and freeze the rest? Sounds like you’re talking about a pork loin, not a pork tenderloin. The tenderloins are pretty small (6-12 inches long, and maybe 4 inches across tops), whereas the loins are much larger. Sauce? When would you add? Hey Gina- I love your recipes and they always turn out great! I have a problem when I’m slow cooking meats on the stove top though- they never get to that “shred easily” point. I am wondering if I’m not cooking at a high enough temp? When it wasn’t ready at the 2 hour mark, I cooked it for several more hours than you recommended and it’s not dried out but is still too tough to shred. What did I do wrong? Based on my experience stovetop cooking, you don’t want to overcook a very lean cut of meat or it will become tough. A high-fat, high-connective tissue cut of meat gets more tender if you cook it at longer periods of time and will shred the easiest. A heavy-bottomed pot, and a stovetop that doesn’t get too hot even at the lowest setting is important, I find. Some stoves just don’t have a true low setting so cooking for long periods will easily overcook. For your stovetop, it may be that even at two hours cooking time for a very lean cut, the meat may have been overcooked. I would test it at 1 1/2 hours, if you try it again. 🙂 I hope that helps. Do you think I can double this in a 6-quart instant pot? Or should I do two different batches? Sorry one more question- new to instant pot – woukd I keep the cooking time the same with a double batch? Yes it should be the same. Hello! I’m new to the Instant Pot, just got it for Christmas. When you say to “Cook high pressure 45 minutes”, do I do this by using the “Manual” button? Had this for dinner tonight in the Instant Pot I got for Christmas; served over zoodles, it was delicious and a hit with my extremely picky boyfriend. I’ve been following your blog since sometime around 2010; I think your turkey stuffed peppers were the first recipe I ever made, continue to make them several times a year. I have never been disappointed with any of your recipes. I would love to see more Instant Pot adaptable recipes in the future! Do you cut up the pork before you sauté it? Or do you sauté the big chunk before putting it in the slow cooker? I made this last night in my brand new Instant Pot and it was delicious! Served it over roasted spaghetti squash. Wonderful meal! This will become one of our regulars! 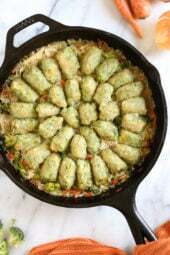 Wonderful recipe – and super easy! Made this for my parents on holiday, little do they realize it’s low carb. They were huge fans. Thanks for helping me introduce this them healthier meals. I’m excited to gift one of the cookbooks to my mother for Christmas as they continue on their new “healthy lifestyle”. Happy Holidays! Can you use pork loin instead of pork tenderloin? Ahhhhhhhh this may have been my problem. I used pork loin and it just really felt like it was missing something. I’ll try tenderloin next time. Are the roasted peppers in water or oil? Wow!! Another spot-on recipe! My husband and fifteen month old devoured their servings with spaghetti and I had mine over some zoodles. Really delicious and it was so easy. Will definitely be making again and again, thanks Gina! This looks delicious. We don’t eat pork. Can you recommend another meat I can use instead? Wouldn’t cooking time change? Thank you! Chicken thighs would taste great. Same time should be ok.
Ive done it with chuck roast or short ribs too! Thank you for the instant pot recipe!! Do you know if you can cook things like this in a rice cooker? Thanks! You can only cook rice in a traditional rice cooker! Don’t try it! You need a crock pot or instant pot. Would this work in my crockpot on high for 4 hours? I’d use the slow cooker directions included. I wonder if high for four hours would dry it out. Could you recommend a substitute for the roasted peppers as they are a bit too powerful for us. Or if they were omitted would the dish be too bland? Ann, Gina may have a better suggestion, but maybe try some sliced fresh bell pepper instead? I know what you mean about roasted peppers – they can taste a bit tart/vinegary depending on the brand. You may even try roasting a fresh pepper in the oven yourself — although I know that’s a bit more work and kind of negates the simplicity of the recipe. I wouldn’t worry about leaving about the roasted peppers, or just reduce the amount. They do tend to add a bit of sweetness but I’m sure it’ll be fine without! I wouldn’t worry about leaving out the roasted peppers, or just reduce the amount. They do tend to add a bit of sweetness but I’m sure it’ll be fine without! 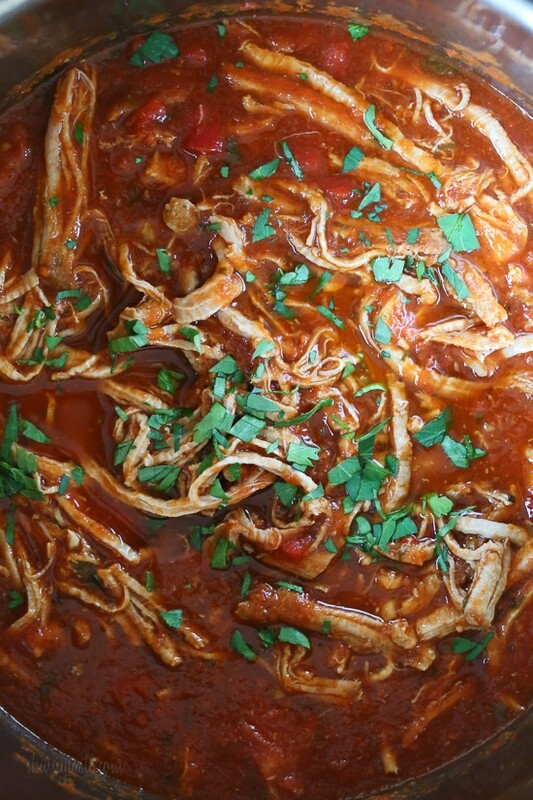 Why can i not pin some of the skinnytaste recipes like the pulled pork ragu? There is no option to pin it. If you hover over the image it should pin. Sometimes that happens if you have an ad blocker enabled.